Family vacating home on Waldorf School property in Altadena. 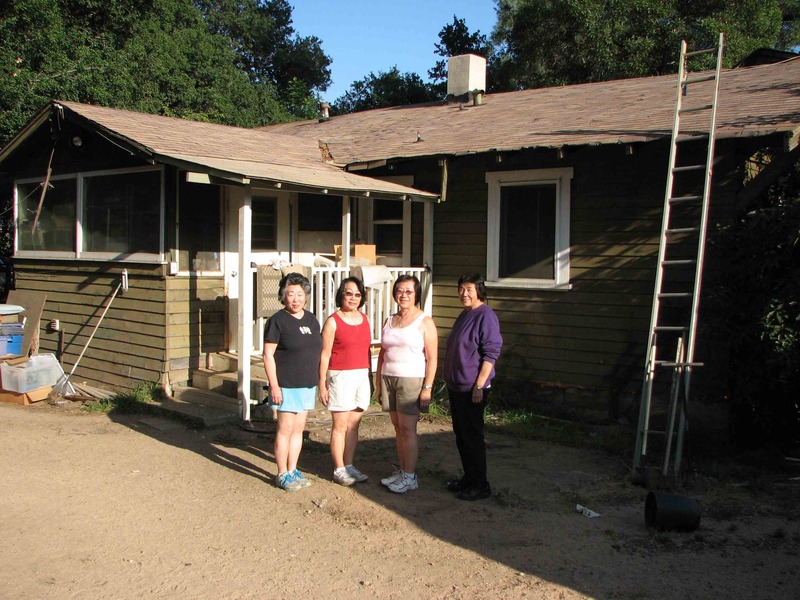 From left: Cindy Yuge, Nadine Ishizu, Joyce Yuge and Carolyn Yuge stand behind their family’s historic cottage on the Scripps/Kellogg estate in Altadena. Takeo Yuge turned part of the property into an azalea farm, taking out patents on several varieties. Remnants of that business, such as a refrigeration unit, are still on the grounds. He also trained young men from Japan, who were put up in a building behind the family home, in American farming techniques. A decorative oar that the men made as a gift for him still hangs above the entrance. Yuge had been the gardener for the estate for 15 years until he and his family were interned during World War II. Upon their return, property owner William Scripps Kellogg promised that they could remain there as long as Mr. and Mrs. Yuge were alive. The Waldorf School honored that agreement after purchasing the estate in 1987. Takeo passed away in 1989, but Fumiko lived to be 100 and passed away last November. The Yuge sisters, who were still packing after the June 1 deadline, and their supporters, including members of the Kellogg family, are asking that the house and surrounding gardens be preserved. The 120-foot Torrey pine towers over the property. 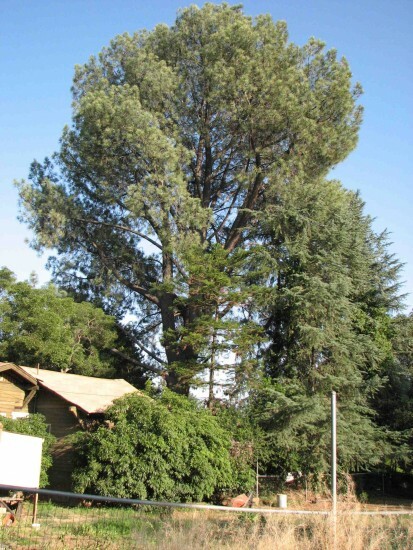 During the Altadena Heritage event, the Scripps Torrey pine (Pinus torreyana), located at 209 E. Mariposa St., was named a winner of the Big Tree Contest along with a Woodbury Moreton bay fig (Ficus macrophylla) at the L.A. County Sheriff’s Altadena site, 2555 El Molino Ave., and Peter Doms and Brenda Hurs’ “Duke of Eucs” (Eucalyptus globules) at 2760 Winrock Ave.
She noted that Altadena Heritage’s efforts are especially important because Altadena is in an unincorporated area of the county and has no city council. One of the Yuge family heirlooms from the prewar years. The Yuges nominated the Torrey pine weeks ago, but the property owner’s consent was required, and Waldorf School officials initially hesitated. Administrator Douglas Garrett told The Pasadena Star News last week that he was unsure what a nomination would have meant for the future, but after further discussion he found that preserving the tree would not interfere with the school’s master site plan. Bill Birney, chair of Waldorf’s Board of Trustees, accepted the tree award along with Garrett, board member Jennifer Shepard, and Director of Development Melissa Puls. “Pasadena Waldorf has resided on Mariposa Street for about 28 years,” he said. “Our property has this Torrey pine that came from the original owners, the Scripps, when they moved to La Jolla. So they brought it up from La Jolla and the story is that it was brought in the back of a station wagon and it was five feet tall then. It was planted by the Yuge family. An oar given to Takeo Yuge and his brothers by agricultural trainees from Japan. The family said in a statement, “The Yuge sisters/family are extremely pleased that the Scripps/Kellogg Torrey pine has finally been accepted as a nominee for the Big Trees Contest of Altadena, even after the deadline passed. We are even more pleased that it is one of the three winners. “Surely, this will ensure that this magnificent tree will be protected to the fullest extent possible. Cindy Yuge has expressed concern that razing the house may be harmful to the tree because its root system has extended throughout the site. In an email last month to supporters of the tree, Don Hodel, environmental horticulture advisor for University of California Cooperative Extension in Alhambra, said, “It is good to hear that the school is interested in saving this tree, but I urge you to remain vigilant. I have much experience in working with situations where developers say they will save and preserve a tree, but when it is all said and done they didn’t save it. 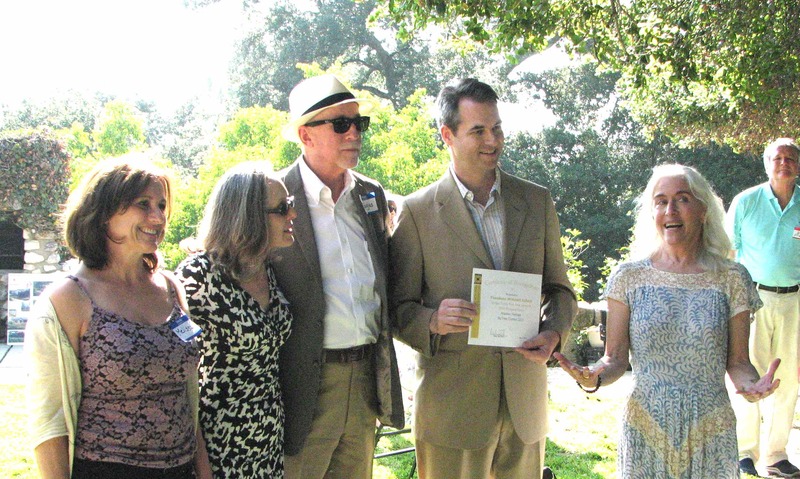 From right: Michele Zack of Altadena Heritage with Bill Birney, Douglas Garrett, Jennifer Shepard and Melissa Puls of the Waldorf School during the Big Tree Contest presentation. Puls issued the following statement on behalf of the school on Friday: “In 1987, Pasadena Waldorf School purchased the beautiful and historic Scripps Hall property from the Scripps Home, saving it from demise by developers. 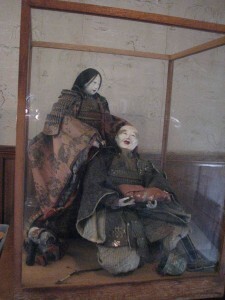 In an extraordinary act, the school’s founders willingly entered into an agreement as part of the sale that would allow the caretaker and his wife, Takeo and Fumiko Yuge, to continue to reside on the property for the remainder of their lives, free of charge or any financial obligation. “Despite being an intentionally small not-for-profit school, throughout the last 28 years PWS has continued to honor the privacy of the Yuge family and has continued to pay property taxes and water bills for the property. The 1987 agreement was negotiated by both parties’ counsel, and signed by Mr. and Mrs. Yuge as well as their four adult daughters. At the time of signing, it was well understood by all parties that the intention was to ensure Mr. and Mrs. Yuge a life estate as Mr. Kellogg had once verbally promised them, and that the agreement would end upon their passing. “PWS also later worked willingly to place Scripps Hall on the National Register of Historic Places, hiring a restoration architect to aid in the process. To this day, we are committed to integrating the history of our campus, the natural beauty and rich variety of trees and plants, and the contributions and legacy of the Scripps, Kellogg, and Yuge families into both our curriculum and the culture of our community. “At our 25th anniversary celebration, Mrs. Yuge was in attendance as the Yuge family history was presented and a beautiful homage to her and her late husband Takeo was read aloud. We will continue to impart Mr. and Mrs. Yuge’s amazing story, including their horrific World War II internment, to our students and our parent community. “The school has been flexible in working with the Yuge sisters in their moving efforts, and has consistently and repeatedly offered to work together once the property, trees and house have been properly inspected and evaluated to determine the best way to permanently honor the lives, work, and contributions of Takeo and Fumiko Yuge on that portion of our property. The school has let the move-out deadline pass that was specified by the original agreement. “Although no particular extension date has been requested by the Yuge sisters, we are honoring a request from their counsel to meet with them on June 9. We are unclear as to the exact nature of the meeting, but it is our desire to resolve this matter in a way that is both respectful of what must be an incredibly difficult and emotional time for the family and honors the agreement that this portion of the property be returned to the school as originally intended. “It was unfortunate that an incorrect rumor spread throughout the media that the school was to take down the Torrey pine and raze the property. The truth is that we would want to inspect not only the tree, but the entire property before committing to any future plans in order to ensure the safety of our students and the continuation of our curriculum and program. “We never intended to take down the Torrey pine. Cindy Yuge nominated the tree for an Altadena Heritage Big Tree Award and following the media’s misunderstanding of our reply to the nomination, we publicly agreed that it was a wonderful idea and a shared value, made the nomination official as the property owner, and accepted the award. It is truly a beautiful giant of a tree with a rich history. “To our knowledge, PWS has only done one walk-through of the house in the past 28 years. There have been no surveys to determine the physical condition and safety of the portion of the property where the Yuge family has been in residence in regards to the suitability of the property for accommodation of future use by for our school’s needs, or to survey the trees and their general health and stability, or to evaluate the general condition of the residence. “The only survey work that has been done to date on that portion of the property has focused solely on the rebuilding of the first- and second-grade classrooms that were destroyed in an accidental electrical fire last August. Many heritage trees have grown up around the area of the destroyed buildings, and experts determined that construction would best be staged through that portion of the property where the Yuges have been residing, prompting these limited surveys. “The replacement of the first- and second-grade classrooms project is the only building or construction plan that the school currently has, and after we work with our insurance company and architects to complete these plans, the school will share them with our Altadena neighbors for input.